When it comes to purchasing custom screen printed t-shirts you want the most value for your dollar. Most people who contact us are new at ordering custom t-shirts. They need them for a family reunion, a party, a new business venture, etc. The have almost no idea where to start and most don’t have a budget but they have an idea of what they think an order of custom t-shirts will cost. 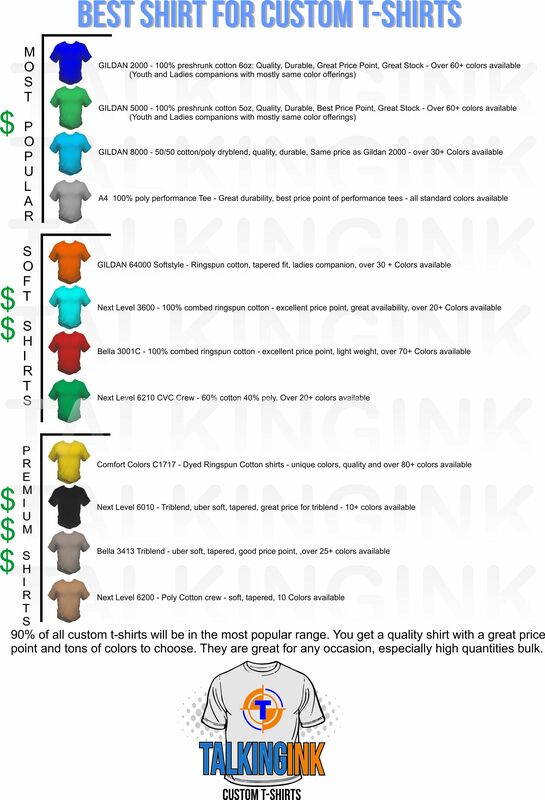 The best shirt for custom t-shirts chart is a simple chart made up of the 12 most popular t-shirts Talkingink Custom T-shirts prints on a regular basis. The one caveat is that the most popular shirts with the best price points and most colors options make up about 90% of the shirt orders we print. The other 10% are made up of the lower 8 shirts on the chart. We’ve made the best shirt for custom t-shirts chart easy to follow. Give it a look and if you’d ordered shirts before more than likely you ordered one of these shirts. Let’s face it, custom t-shirts are marketing, they are a walking talking billboard and you want to get the most bang for your buck. If 90% of the people are ordering the same shirt for their custom t-shirts, why would you want to break that trend in the name of spending more money. The truth is all screen printers pay the same amount for their t-shirts because we all utilize the same six or seven distributors. The real price on your custom t-shirt order comes down to what each screen printing company charges. So the price you get from one screen printer may be different from the price you get from another because while the price of the shirts is the same, shops setup fees, screen frees, and printing pricing will differ. That’s where history, reviews, and personal experiences come in to play to make your decision. In regards to the best shirt for custom t-shirts chart, you can’t go wrong. All of the people before you who have ordered custo t-shirts have ordered these shirts time and time again. So it’ comes down to personal preference. Do you want a really soft shirt that costs more or do you want the standard shirt that everyone orders. Will the style and feel of the shirt have a direct purpose on your marketing? It could, softer is better and everybody wants soft shirts. But does that higher cost benefit the return? I can’t say unless I know what you’re doing. I will say in most cases, the Gildan line will best serve your needs. They are the largest t-shirt manufacturer and even own other brands you have herad of. They make the highest quality shirts at the best prices. They have great stock in all of the colors and they are readily available on a quick turn around. My recommendation when getting a price quote on custom t-shirts is to start with the Gildan, and if you have room in your budget go up from there. Either way you can’t lose. You are getting the most popular t-shirt on the planet with the Gildan line at the best price available.